The NHTSA is utilizing this campaign to show the importance of targeting this age group and their parents about seat belt safety. 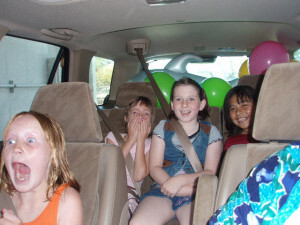 It is absolutely vital for tweens to use their seatbelts any time they are riding in cars because these are formative years that immediately precede driving privileges for teenagers. Unrestrained Tween Facts: Did You Know? Within the past five years, 1,552 children between the ages of 8 and 14 died in car, SUV or Van collisions. Around half of those children killed were not wearing seatbelts at the time of the crash. The percentage of child passengers who die while riding unbelted tends to increase with age. This more pronounced among 13 and 14-year-olds, regardless of seating position. The campaign targets the parents of children between the ages of 8 and 14 years old. Why? This is a very important time to instill the habit in children of always buckling up, for every trip. Tweens are just a few short years away from being in the driver’s seat, which makes this campaign all the more important. Parents are encouraged to lead by example. No matter how short the trip, any time you get behind the wheel you should fasten your seatbelt before heading anywhere. Tweens are constantly learning how to be responsible and make good decisions. It is up to the adult or adults in the car to make sure they are always buckled up. Again, it doesn’t matter if you are driving 2 miles or 2,000, tweens, children and adults need to be buckled up for every ride. If you or your tween was injured while riding unrestrained in the car with another driver, a Florida Auto Accident Injury Lawyer at Whittel & Melton can help you determine the best course of action. Call us today at 866-608-5529 or contact us online to request a free consultation.